I picked up this book in a Chatham Massachusetts bookstore while on my Anniversary Escape with Leao. First drawn to the cover (What can I say?I love beautiful books.) and read the back cover and knew it needed to be added to my book collection. I found this book so easy to slide right into. The story draws you in going back in time first with very vivid details. And then delivering you to the present every other chapter. This never was a nuisance it actually made me want to keep reading and guessing what happened. I love gardening and was fascinated by the concept of story line around the Camellia flower. I truly enjoyed the descriptions of the garden in the book. 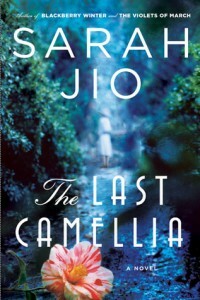 This was my first book by Sarah Jio and I will definitely be looking for another of her novels to read.